Corporate success depends on the work of good teams – from the Board to the sales force – and every good team needs occasional ‘time out’ to reflect on its processes and improve its performance. As experts in the provision of outdoor activities and team building events you can expect professional support and incredible choice. We also can provide full conference packages as well as evening entertainment. The information below gives some idea of the range of services available. We offer tailormade team building events to suit both your needs and your budget. Often using the outdoors for training, we find that for most teams – one day will work wonders, three days can produce miracles! Devon Country Pursuits is the number 1 choice for Team Building Devon we can provide Team activities and Team Events that can be bespoke to suit any need or requirement. Our team building options are flexible and will provide a day that fits individual company aims and objectives. Our expert instructors offer a wide range of activities that are divided into 4 Categories -Constructions tasks, Communication & Creative Tasks, Fast Tasks, Initiative & Mental Tasks to improve team performance as well as guarantee fun is had by all. Whether you are looking to introduce new teams, future team leaders, or improving client relations; we have a format to achieve your goals and corporate aspirations. 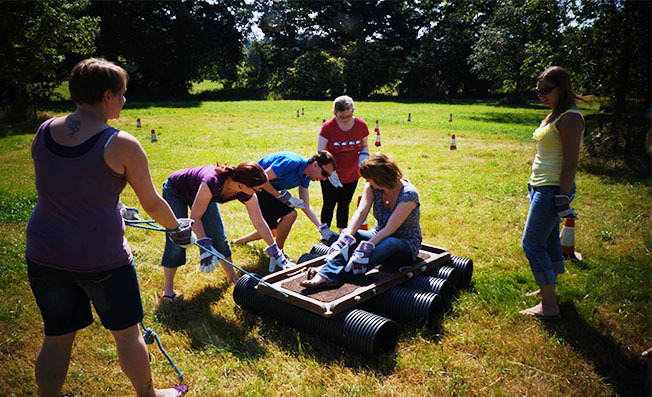 We can provide a day which incorporates not only teambuilding activities but corporate outdoor activities such as Corporate Quad biking, Corporate Archery, Corporate Clay pigeon shooting, Corporate Paintball, Corporate Laser Tag and more. Merging the combination of both ensures a fun proactive day in which staff can feel rewarded as well as challenged. We will aim to work with any budget and time frame .We even link up with local hotels to provide conference facilities and overnight accommodation which can be included in the day to ensure your Corporate Event in Devon is organised to the very last detail.
? If you are searching for fun corporate events, team activities, staff away days, teambuilding activity days, group activities for adults,fun days out, bespoke team events, we are your company!